Since I bothered listening to much new hip hop. However, I accidently stumbled upon this tune by Killer Mike and was very impressed by the lyrics, beat and (dare I say) video. In this age of post modern bling, name changing Snoop Doggs and incredibly vacuous subject matter, it’s a refreshing change to find tracks like this still being made. With its cynical 1980s sound bites and military industrial complex hatred, it should come as no surprise that this was produced by Brooklyn’s famed El-P… and yet it does, as the last time I heard an El-P album (or indeed saw him live), he was channelling Trent Renzor (via Rawkus) and had just released 2007’s I’ll Sleep When Your Dead. This however is a welcome throwback to his Mr Lif times and grabbed me from the get-go. Strong words, great beats and a video somewhat reminiscent (to me at least) of Ralph Bakshi’s early 1970s oeuvre. Take 4 minutes and check it out. One of the most unpleasant things about living in Asia and loving music is having to deal with the human detritus known as “expat promoters”. We’ve all witnessed the unedifying spectacle of expat no-hopers with delusions of grandeur who think they can reinvent themselves as music promoters in an Asian country, despite having no understanding of the music. Too often this leads to a stream of mediocrity that undermines the music scene of the host country. Grubby “festivals” with cheesy acts and tacky corporate sponsorships. It’s fair to say that most of the people who have built the really meaningful underground scene across Asia in the last few years were locals…I’m thinking DJ Jase in Vietnam, Red-I and Soulflower in Manila, DJ Dragon in Thailand. Still there are exceptions, and one of the most notable exceptions is the notorious Drunk Monk. 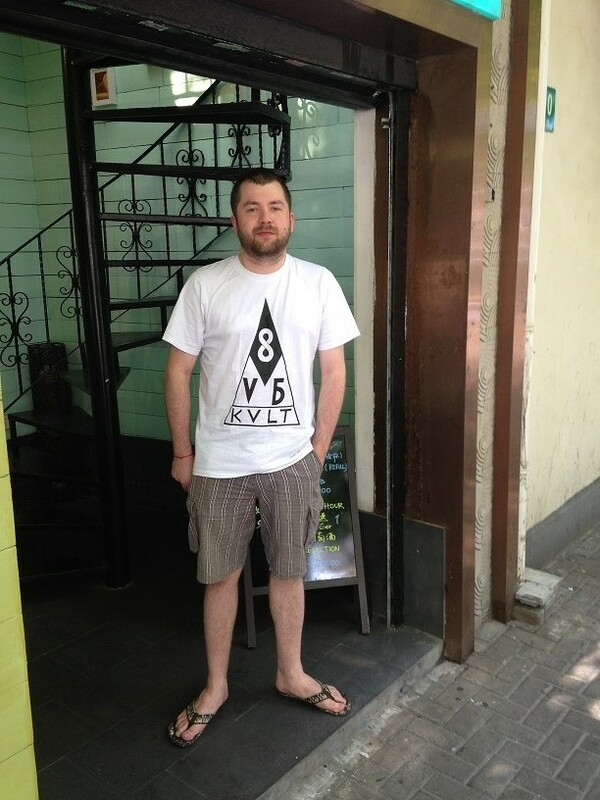 English by origin, he’s quietly built up an operation in Shanghai that encompasses a nightclub (Shelter), a regular bass music night (Sub-culture) and now a record/clothing label (SVBKVLT). Throughout all of this he’s always displayed a true love for and appreciation of underground bass music. Most true fans of bass music would now be aware of Drunk Monk and the Shanghai scene, especially since Kode 9 released his track Xing Fu Lu, named after the street in Shanghai where Drunk Monk’s apartment is located. This is all quite amazing when you consider that in the middle of last decade the Shanghai bass music scene was starting from absolute zero. On my trip to Shanghai a few months ago I caught up with Drunk Monk to find out how he made it all happen. Again it’s a testament to the guy’s true underground ethic that he immediately agreed to meet up with a complete stranger and answered my questions about the scene with good humour. Let’s kick off with a musical biography of Drunk Monk. What kind of music did you first listen to and what kind of subcultures were you involved with before you got into bass music? My father was a record collector and DJ who played a lot of reggae, dub and jazz. I always grew up around vinyl and records. I guess the first kind of stuff I really got into was jungle and drum’n’bass around the mid-90s, though at that time I was still too young to go to parties. I started off by listening to jungle on the radio. Later on I was DJing Jungle, and then I got more seriously into record collecting and digging for vinyl – looking for soul, rare groove and reggae records. I’m originally from Manchester but I lived in Liverpool for 3 or 4 years before I came to Shanghai. I was DJing in Liverpool with a crew called “No Faking” – mainly rare groove and hip-hop. Then I came to Shanghai and started playing more reggae music, then gradually I got into other types of music such as bass music and that’s how Subculture started. We already had a reggae night called “Uprooted Sunshine” and Subculture grew from that. At the beginning it was just a party were we would focus on playing more electronic music instead of reggae. When did you start going out to parties in Manchester? Did you live through the really violent era of Manchester jungle around ’94-’95? I started going out when I was 17 or 18, around the year 2000. So I was too young for that earlier era of Manchester jungle. So what was the Manchester jungle scene like around the year 2000? Was it still very gang-orientated with the likes of Moss Side and Cheetham Hill turning up? Well I was listening to jungle and buying jungle more than I was going to jungle parties, but I certainly never experienced any violence. What year did you come to Shanghai? I first came here as part of a university course in 2005. That’s when I started putting on events here. What was the scene like when you came here? Was there anything interesting going on? Not a lot. There were very few venues that would let people play good music. A lot of the promoters who are big now started around the same time in 2005. Michael who now runs Antidote did his first party in 2005 and then a week later I did my party in the same bar. There were just a few small bars that would let you do your thing. Then gradually we all came together, helped each other out with promoting and it grew from there. Where was the interest for reggae music coming from in Shanghai at that time? In 2005 was it all expats or were there some locals who were already getting into reggae? It was mainly expats, there was a small Chinese crowd which has grown over the years. When you started putting on reggae events here, was there any crossover with the Beijing skinhead scene? People like Misandao who are an Oi! band but who also obviously enjoy skinhead reggae. Not really, no. I didn’t know much about the Beijing scene at the time – I’d only just arrived in Shanghai. And when you first arrived in Shanghai in 2005, were you already into the emerging dubstep scene of the time? Yeah, I was already buying a few bits and pieces. Around 2005 – 2006 I played a few dubstep sets but it took a while for people here to get into it. When would you say was the tipping point for people in Shanghai to get into bass music? When we opened Shelter in 2007 I started Subculture straight away. But for a while it was the slowest of our nights – people didn’t really understand the music. At one point my partner in the Shelter wanted to move Subculture to a Thursday night, because we weren’t getting enough people. But I pushed forward. Around 2008 it started picking up more. Now for the last couple of years it seems everybody is playing bass music! I’ve never had a chance to visit the Shelter, but what I’ve noticed online is that you’ve always seemed to display impeccable taste in bass music!! You’ve been photographed wearing a Skull Disco shirt, and of course you have very strong links with Kode 9. So it looks like you always gravitated towards the most interesting end of that scene. Was that your musical policy back in 2008? Were you playing more “difficult” stuff like Skull Disco rather than the Caspa & Rusko end of things? Or was it more of a cross-section? We were never really playing the more commercial end of things. The first couple of artists I brought over were people like Goth Trad and the Bug. So it was always that deeper, quality sound. Who was the very first non-local DJ that you brought over? I guess Goth Trad was the first and then a month later brought the Bug. That was in 2008, it was actually the Asian launch party for “London Zoo”. How did you actually manage to hook that stuff up? In 2008, you would have expected an Asian launch for “London Zoo” to be somewhere like Osaka or Tokyo, not Shanghai! There was an English guy living in Beijing named Steve Barker, who used to have a reggae show on BBC radio and also writes the reggae reviews in Wire magazine. I got to know him through mutual friends. He was close with people like Kode 9, the Bug, Shackleton and Mark Ernestus and he introduced me to them which was really helpful. Wow – you had Mark Ernestus out here as well? Yeah – with Tikiman in 2009. They spun a lot of dancehall instrumentals. Alright…now turning to some of the local Shanghai acts, obviously over the last few years the most high profile act to come out of this scene is Cha Cha. But apart from Cha Cha, are there any other locals who are starting to produce some interesting music? Hmmmm….its more in the hip-hop/beat scene. There’s still not much on the bass music side. There’s a guy called Sig who’s interesting, but it’s not really bass music….it’s more hip-hop. There’s some guys in Beijing but they’re kind of more on the commercial side of things. Why do you think that is? Normally after so many years of quality DJs coming through, some local kids would get inspired by it and start to make interesting music themselves. In some ways you have a really strong scene here now. You have the club, the label, and Kode 9 has even referenced it in his last single! So why is it that some local kids haven’t kind of latched on to this local music identity and run with it? Good question… I mean there is a scene of local DJs but they are mainly more techno and electro. I guess there’s not a great deal of money to be made in bass music. Otherwise…I don’t really know why we haven’t had more local bass producers come up!! So putting aside bass music, which are some of the local Shanghai acts in any style of music which you respect? 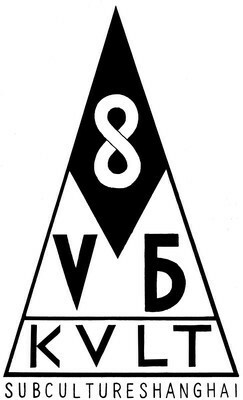 B6, a minimal techno producer. There’s also a guy called MHP who makes dark techno, part of a crew called Void. He’s had a couple of vinyl releases. There’s also an interesting local hip-hop guy called J Fever, from Beijing. What about some of the other internationally known Shanghai acts like Duck Fight Goose or Torturing Nurse? Oh yeah I really like Duck Fight Goose and know those guys quite well. I’ve never actually seen Torturing Nurse – I’d like to see them. So not much crossover then between the harsh noise scene and the bass scene? You’ve never had Torturing Nurse on at Shelter? No, not Torturing Nurse. We do have a monthly drone/noise night now though. But there isn’t much crossover between the different scenes in general, like between the rock scene and the electronic scene. It’s all still quite segregated. I’m not sure why that is. So you recently started a label and are releasing things on cassette. What was the impetus behind a cassette label? Were you influenced by some of the cassette labels that have started up in England in the last few years, especially the “No Corner” label from Bristol? Yeah, I guess seeing the tape thing come back was an influence. But frankly, its mainly because I just wanted to put out a digital product – I didn’t want to do download only. I’m not a fan of CDs and vinyl is quite expensive, so cassette was really the best option! And as regards touring DJs, what’s at the top of the list of people you want to bring out? I’m slowing down a little on the international DJs. Kode 9 is coming in December, but otherwise I want to focus more on working with Asian DJs and helping bring the Asian scene together. In November I’m bringing a couple of Asian DJs representing different countries to play in China. It’s going to be DJ Jase from Vietnam and a couple of others. And what does the future hold for the label? You’ve started off with some great cassette releases by Caliph8, Cha Cha and others…What surprises do you have up your sleeve? I do plan to start putting out some vinyl. I’m going to release a 7” by Caliph8’s new band Bent Lynchpin. Wow….I know Caliph8 is a huge fan of krautrock and 70s prog. Does that come through in his band project? Awesome! How did that whole Pinoy connection come about actually? I think it started when the crew who went on to start the B-Side bar in Manila came to Shanghai to see DJ Bone from Detroit play at the Shelter when the Void crew brought him out. The Shelter actually became their inspiration for starting B-Side after they saw what was possible. I met them when they came here, and we started doing bookings together…they were doing Kode 9 and Pinch in Manila when I brought them here. Over the years we just built up a link. It was actually Michael from Antidote who first brought Caliph8 over here. Ok…now let’s finish up with a real trainspotter question. Give me your top 5 dubstep tracks of the last 10 years…the first ones that come into your head. “Lean Forward” by Mala…just about everything Mala’s ever done in fact! I’m trying to think of a newer dubstep track…but can’t really think of one! So maybe my 5th choice would be the Kode 9 remix of “Find My Way”. I really like that sound a lot…I play a bit of that 130bpm Keysound kind of thing, like Wen and Beneath. I’d like to bring Beneath out sometime! I also play quite a lot of footwork. I think I first saw Caliph8 play at a party in Quezon City in 2005. The party was pretty boring until suddenly out of nowhere this cat set up his equipment and dropped abstract hip-hop grooves while yelling out about Sun Ra. On a screen behind him somebody was projecting footage of the same cat running through some kind of warehouse while wearing 70s clothes and a crazy afro wig. That’s the way I remember it at least. The cat was Caliph8 and I couldn’t believe what I was seeing and hearing. The stuff was so good that I couldn’t control my fanboy impulses. I think that I did something embarrassing like approach him afterwards to mumble that he reminded me of Labtekwon. A few days later I actually got his number so I could call him up to rant more about how good his beats were and enquire if he had any releases I could buy. Sadly, there were none. Our paths crossed a few times over the following years, including a great evening of sitting around listening to our favourite tunes in Hong Kong. But still there was no Caliph8 release to file away in my collection. That situation has finally been rectified by Drunk Monk’s new cassette label SVBKVLT. Drunk Monk deserves the greatest respect for putting his time and money into something as positive as SVBKVLT, and there’ll be a short interview setting out the Drunk Monk story on this blog very soon. But for now, let’s stick to this review of the Caliph8 tape. With this background and his legendary MPC skills, “Derelict Features” almost plays like some kind of hybrid of Pierre Henry with the Arkestra or the Art Ensemble of Chicago. This is very far out ahead of any straightforward hip-hop beat tape. No obvious bangers, the whole thing really demands to be listened to as a single piece from start to finish. Trite as it may be to say, his time doing live film scores has led to the production of a true example of that oft-abused concept the “imaginary soundtrack”. 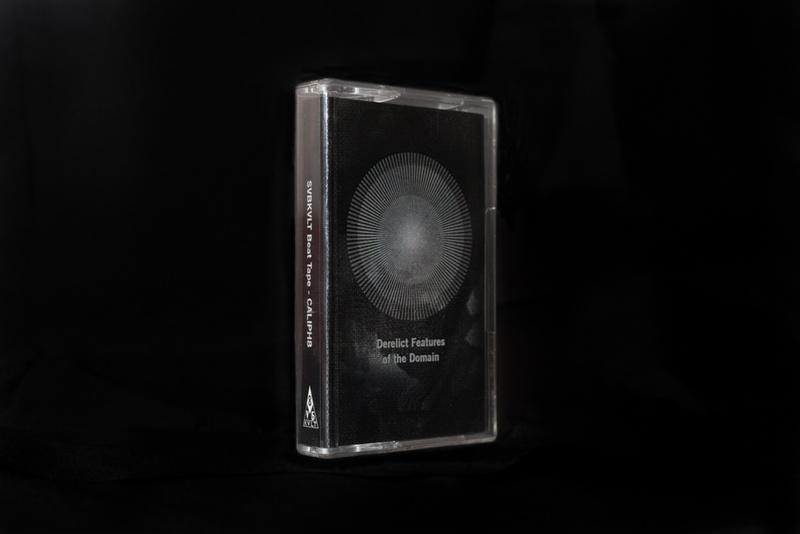 Musique Concrete elements, dissonant horns, dub effects and drones collide with intelligent and non-cliched breaks over two sides of the tape. I really can’t describe it better than that and highly recommend that you listen to it yourself. Caliph8 is pretty far out on his own with this one, but if I had to try and file it with something else happening in the music scene today, I might try to slot it next to the abstract beats and electronics end of what Young Echo are doing. But without wishing to seem too hyperbolic, the comparison which most springs to my mind is a kind of Asian version of Rammellzee, due to Caliph8’s ability to naturally bridge the worlds of the street and modern art (Rammellzee being somebody who bridged the street and modern art without any of the posing of that notorious fool Basquiat).